Front Page: Slater relegated to the round 2 like many other Big names. 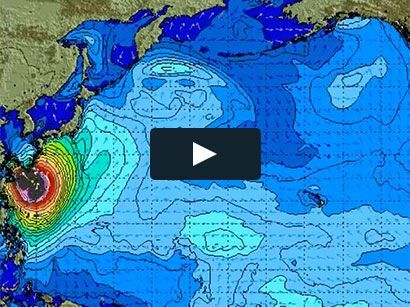 COOLANGATTA, Queensland/AUS (Wednesday, April 3, 2019) – After an anticipated start, the World Surf League (WSL) Championship Tour (CT) is officially open for the 2019 season. The first day of the Quiksilver Pro Gold Coast saw the completion of Round 1 where the men took on Duranbah, the event’s back-up site, in four-to-five foot conditions. The Red Bull Airborne Gold Coast also got underway today with the first Qualifying Round. The Red Bull Airborne is a three-part specialty series that highlights surfing’s most creative feats. The event saw no shortage of action with standout airs from CT star Italo Ferreira (BRA), aerial specialist Chris ‘Chippa’ Wilson (AUS) and Hawaiian surfer-skater Kalani David. Rookie Seth Moniz (HAW) is off to a strong start in the first event of his rookie year on the Championship Tour. Round 1 winners also included CT sophomores Griffin Colapinto (USA),Michael Rodrigues (BRA), third-year elite competitors Kanoa Igarashi (JPN), Joan Duru (FRA), along with veterans Adrian Buchan (AUS), Michel Bourez (PYF), and Kolohe Andino (USA), who will all advance straight into Round 3. 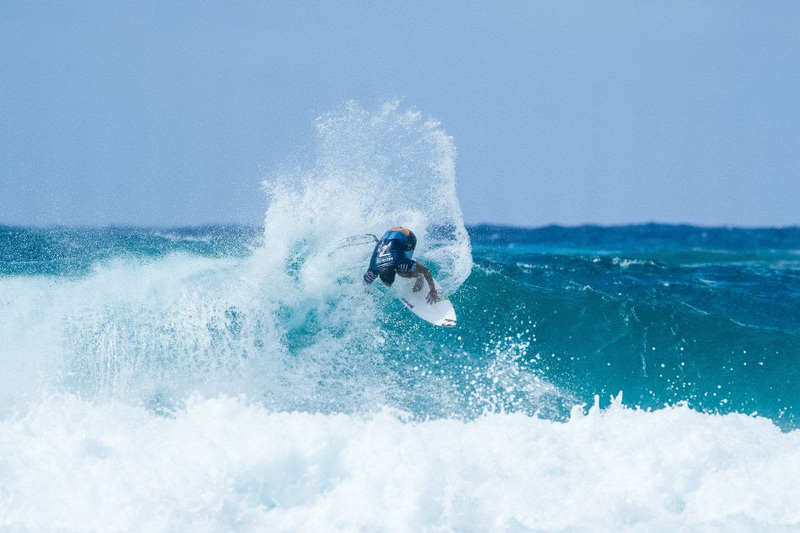 The long-awaited return of John John Florence (HAW) was met with an equally awaited rematch with the now-full-time-competitor Mikey Wright (AUS) after last year’s battle. The heat also included rookie Peterson Crisanto (BRA) in the mix. While Crisanto gave Florence a scare in the dying minutes, the two-time WSL Champion responded with an impressive air of his own and secured his place into Round 3 behind heat winner Wright, who maintains his status as a threat to the elite. 11-time WSL Champion Kelly Slater of USA. 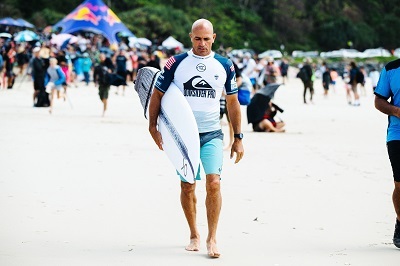 11-time WSL Champion Kelly Slater (USA) fell short in his opening heat to Yago Dora (BRA) and Italo Ferreira (BRA). After flashes of brilliance in 2018, CT sophomore Dora narrowly requalified but showed his maturity on opening day with a clutch win over compatriot Ferreira and Slater. Dora’s aerial attack put both Ferreira, one of last year’s early World Title threats, and Slater, one of the sport’s greatest, on their heels midway through the heat. Yago Dora (BRA), 2018 Red Bull Airborne France winner. The Red Bull Airborne Gold Coast followed men’s Round 1 with the first three Qualifying heats, which showcased creativity above the lip on the Duranbah beach breaks. The freakish talents of the 18-surfer field launched with entertaining attempts by Harry Bryant (AUS) and Reef Heazlewood (AUS) and a few standout landings from Kalani David (HAW) and Filipe Toledo (BRA). But, only Chris ‘Chippa’ Wilson (AUS) and Italo Ferreira (BRA) were able to find truly perfect ramps and post scores of consequence during the first qualifying round. Known the world over for producing some of the most mind-blowing free surfing clips of the last decade, Coolangatta local Noa Deane struggles to remember the last time he pulled on a contest jersey and competed for scores. Although Deane admits he’s not the most competitive guy in the water, he’s excited to see what heights sharing the lineup with 18 of the world’s best aerialists will push him too. The next call for the Quiksilver Pro, Boost Mobile Pro and Red Bull Airborne Gold Coast will be tomorrow at 6:30 a.m. AEST, when event organizers will assess the conditions to decide the event’s location and schedule.